Every living being and phenomena leaves a code that is a unique signature to be read if a relevant method is applied. 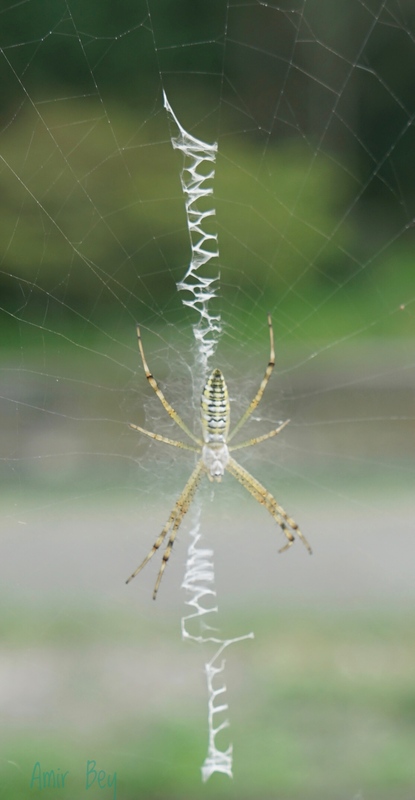 This past summer I was taking a walk along a river in the Okabe-Cho, Shizuoka Prefecture in Central Japan and noticed a series of spider webs on a fence and in the bushes at the river’s side. 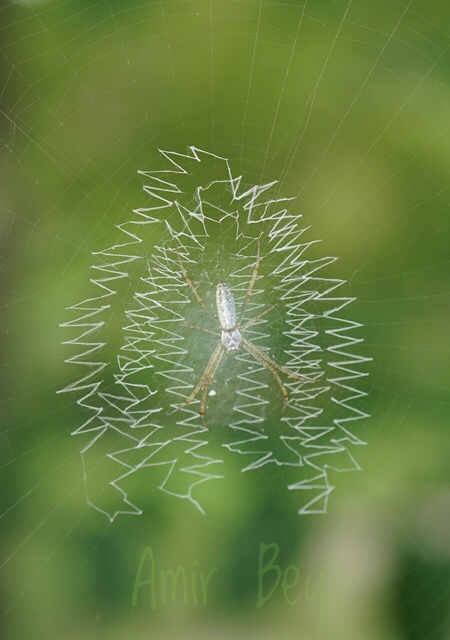 The webs formed thick lines in their center that appeared to be writing, or lines that could be taken for messages. 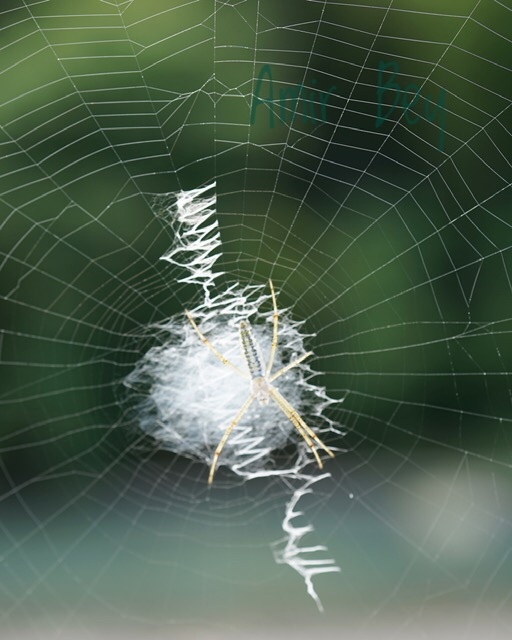 A spider in the web leaves messages as it moves. This shape and the spider's place suggest a wristwatch. Ever try telling time by spider? 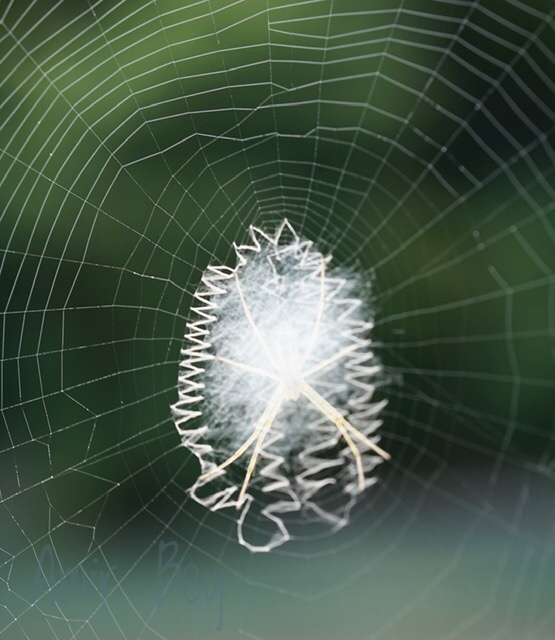 What could these designs mean, beyond being thicker, stickier webbings that enabled the spiders to catch their prey? With oracles, we have historically used nature’s motions and patterns to divine meanings. Could these spiders be offering insights? 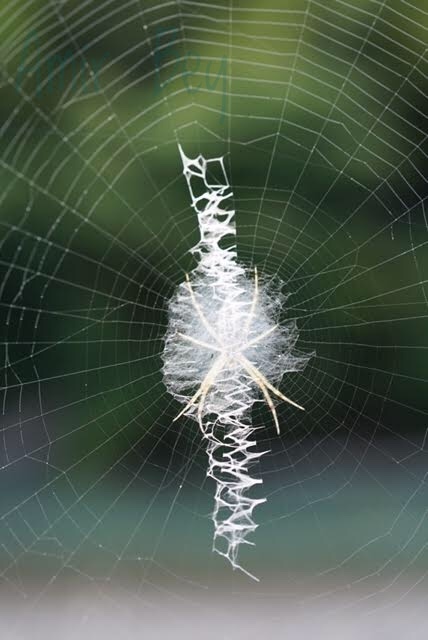 The structures enable spiders to camouflage themselves, while they wait to catch their prey through the adhesive strands. What if these patterns and shapes were used to extrapolate messages or responses to questions? What kind of environment, natural or created, would best provide answers to queries? Is this spider in an ocean? This message is a little off-time from the "wristwatch" image! The spiders hang with their heads pointing towards the earth, fascinatingly, their heads and thoraxes form a skull-like shape, sometimes as white as bone. There are many parallels to be found in nature, and it is not clear what the purpose is when they appear. Maybe those correspondences are beyond human capability to make all of the connections? Finally, how much are we to know? One method would be to have a garden with bushes, fences, vines, and other structures where spiders could spin their webs. A person seeking answers to questions - the querent - would think of a specific question or just focus on a general feeling and stop near one of the webs. The reader would then take note of the web if one is selected, or in front of or nearest to the querent and divine the message from the spider. Spiders have 8 legs, like the spokes on the Buddhist Dharma Wheel. Is this Wheel, the spider, on an angle relative to the thick web, that describes a direction, or is it somehow disoriented, or are the lines askew? Is the spider hidden, or seemingly overwhelmed, or dominating the structure? Does the thick web appear to form characters or signs? Is there prey caught inside that area? If so, what is its visual impact, what kind of prey, and in what condition? Or does the whole web, from the webbing to the spider, suggest a galaxy, or a time piece like a watch, or other shape? This spectacular photo by Yukari Nabeta of a natural Spider Garden in Minamiboso, Japan, has webs that look like spinning galaxies. “Messages” could be explored in them! 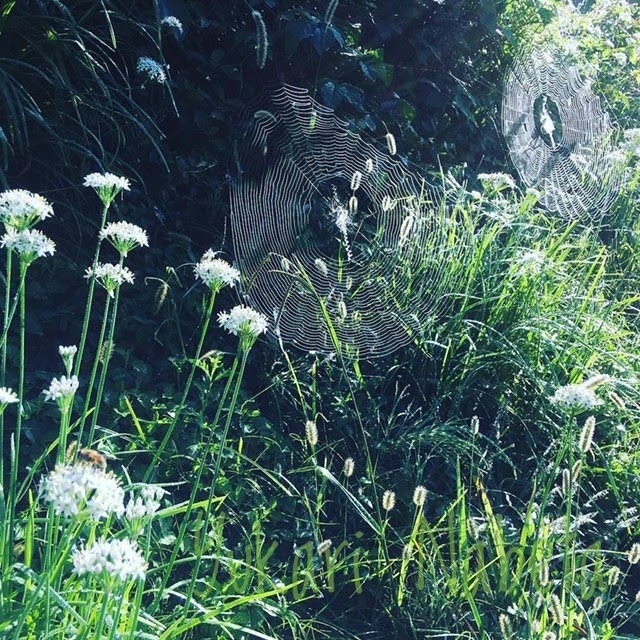 This type of Spider Garden was not designed, but an area could be loosely defined with narrow pathways with assortments of small wooden structures for plants at intervals to provide structures for vines to grow, and places for spiders to make webs. Since winter would forbid Spider Gardens, only the warm months are possible. 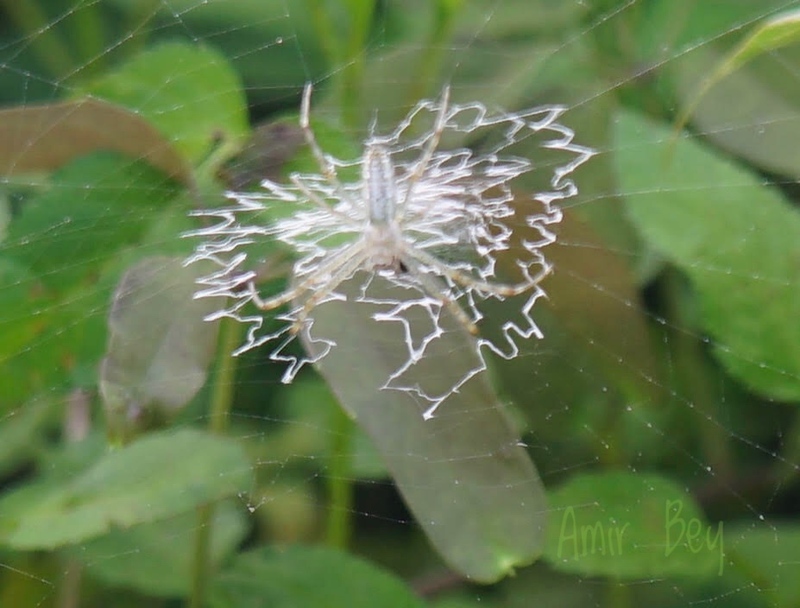 The garden’s shape could follow elements of a spider’s, with an open oval shape at its center for its body with 8 paths stemming from it for a spider’s legs. Concentric paths encircling that “body” and crossing the “leg” paths can represent a web’s lines. The paths can be defined by pebbles or stamped down earth. Depending on a garden’s location, there can be running water from a nearby stream, or other enhancements, such as flowers, which also serve to attract insects. Is it possible for a spider's luminosity to light the far reaches of a garden, like a star? Depending on the light, wind currents, and how the spider chooses to hide on one side of the area of its "messages," determines the energies that are felt by the reader and the querent. Whatever the conditions, there is the certainty that a spider patiently waits for its prey. And then there are some big, bad web dwellers that have a bold, dynamic, message!